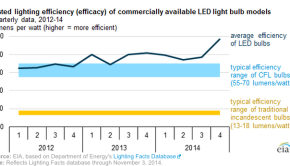 Is PJM Costing Consumers $1.3 Billion By Ignoring Energy Efficiency? Can This California University Create A Zero Emission Vehicle Future? Can REthinking Power Generation Create A Renewable Energy Future? One wonky court decision might have just unlocked America's renewable energy future by requiring regional coordination between states and utilities. Are Utilities About To Kill Solar Energy’s Future In North Carolina? Even though California once again dominates Clean Edge's annual Clean Tech Leadership Index, clean energy keeps growing in almost every corner of America. A Simple Solution To The Complex Problem Of Offshore Wind Costs? Enlist In The Climate Victory Campaign!